So it finally arrived. But first, a little back story. Zealand we met up. And of course the terrible wonder that is Facebook made keeping in touch easier again when we fell out of the letter-writing habit. Networking - is nothing sacred, that her pet rabbit (bunny) died. If there was ever a time, it was then. 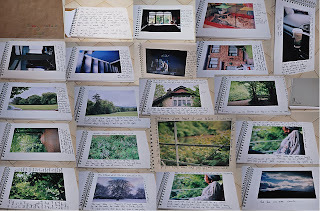 So I put together "Jenny's Picture Book"
I took a roll of film out in the SLR, planned a few locations to shoot. Around the house, my room and Marley Park - somewhere to take some nice pictures I can write around. In some cases I wrote updates on life on my side of the equator, in other cases I commented on the picture. For example; some Yeates-Quoting graffiti, the resultant bluebells of my "search for Spring" and the dilapidated cottage on park grounds. I'm surprisingly happy with the roll of film over all, as in - there was a lot of shots I liked, rather than just a few. I got word yesterday, after thinking it was taking time, that it arrived and was very well received. Happy days. Glad I could be of service. I've had some less-than-great news. The job I was being trained and settling into has been cut short. I was told they were "looking for more speed" and older staff were asking for extra shifts and the manager in charge of the rota said she'd prefer to put them in so there were "no shifts left" and it "was a case of last in, last out" or something along those lines. I'm quoting to resist the urge to biased paraphrasing. I could be paranoid and come up with my own conspiracy theories as to why I got let go (as of yet, I don't know if anyone else was) but I'm just more annoyed in how it was handled. I was in Monday, it was quiet, told I could go home early - which has happened before. Tuesday the general manager called me and gave me the news and that I didn't have to do my shift on Thursday. Quite the kick in the teeth ... had my last shift and didn't even know it. So I'm many respects I have been distracted, and in a bout of irony I am now trying to distract myself from said distraction. Some photographic evidence of said distractions I'm baking form. Pistachio and plain chocolate muffins. Notoriously difficult to de-shell, the pistachios left a little to be desired - a hint of the flavour is there, but more next time for sure. Nonetheless, they're delicious - and photogenic. A breakfast variety are soon to follow. 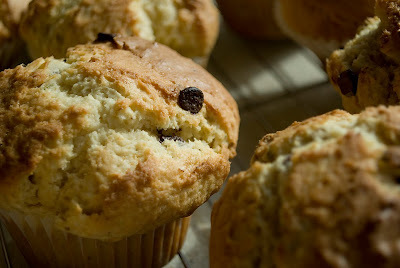 If all else fails I'll do a cookbook dedicated to muffins. Breakfast, snack, sweet, savory, treat, dessert; the cupcake has had its time, now it's all about muffins as far as I'm concerned. 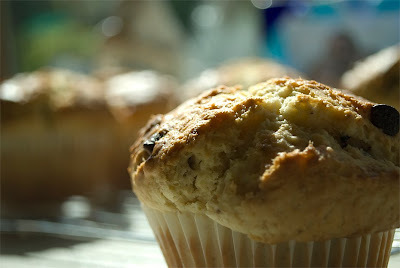 I have a recipe for carrot cake muffins, I may try to come up with one for Black Forest Gateux (spelling, anyone?) or Brazilian chocolate cake (it involves cola I'm told). In describing my baking endeavour as a muffin party, my filthy mind notice tbd innuendos available on the subject. Working titles include - "Dirty Muffins - Baking for the Filthy Minded" or "Bluffin' with Muffins"
Humidity is an odd thing. It makes me feel like I can't breath and gives me a headache. But a warm humid night is a rather nice night to be locked out of the house (it didn't last long, don't worry). Plenty of wind making the clouds glide across the sky. It's so strange how they're orange at night having been white all day; light pollution is a strange concept. While the weather was not my friend today - I got my photos back from the day in Marley Park. There's plenty of green, plenty. I started to assemble them into a book for a friend of mine; the idea being one roll of film to show her around life here in Ireland (she's in New Zealand) contained in a little book with accompanying text; more than captions, an illustrated letter of sorts. I was planning this when she sent me a birthday present, but barely had time to change my socks never mind go out and shoot a roll of film just for the fun of it. So far I covered the front cover in brown paper. Always loved its texture and understated quality; it's really quite pretty I think. In my last job I bought enough to keep a constant supply for presents; brown paper and ribbon - the right people appreciated it at least. Alas, this air pressure is reeking havoc with my head. Bed is calling, as is an early shift in work. Update on the book later.